As the breath moves into the body a space is created, as the breath moves out there is room for the body to move into that space. We choose the quality of movement by our intention. Do we chose to introduce work into that space, thus using gentle force to sculpt and create asana or do we allow that which is around that space to move in with a softness? In my Practice I choose to do both. The first is the dynamic quality of allignment, initiation of muscles, bone and tissue. 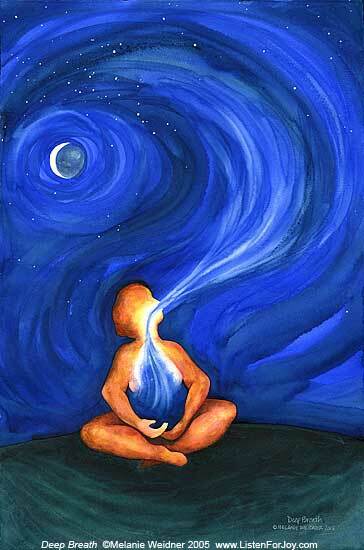 This is where the breath is strong, elongated and very conscious. Then when the Asana is where I want it to be I release the ‘work’, release the pose and allow the breathe to move in a soft natural way. The asana and breath have enough synergy now that I can ‘give the pose away’. This dose not mean losing integrity and falling into collapse. It means allowing the effort to release and the body to be moved and opened by the breath. If the body is open with postural integrity the breath can do all the necessary work. It is also in this stage where the organs have the ability to be supportive, moved and touched by the gentle oscillation of the breath. I find the use of Drishti (focus points) helpful in settling the work and releasing the need to go anywhere with a pose. Next Journey into the spine.